December 3, 2018, (Cohoes, NY) Aquatic Development Group (ADG) is proud to announce that they have completed their work on Phase 1 of the SoundWaves water experience project at the Gaylord Opryland. The indoor portion of the expansion opened to the public this past weekend. The 111,000 sqft three-level facility features five waterslides, a FlowRider® Double, rapid and lazy rivers, an activity pool with rock climbing and more. Currently, SoundWaves is only open to guests staying at the Opryland Resort who have purchased admission and is slated to operate year-round at a temperature of 84-degrees. The outdoor portion of the project, also being designed and built by ADG is expected to be completed this summer. “SoundWaves, the latest attraction to Music City, opened with a splash on Saturday at the Gaylord Opryland Hotel and Convention Center. A $90 million, three-level, music industry-themed waterpark with slides, a river ride, and what looks to be a treadmill for surfing is now ready for the enjoyment of guests staying at the resort. The SoundWaves park is only open to guests staying at the Opryland Resort who have purchased admission, but discounts and special tickets are reported to be available to residents of Davidson County. The water experience is planned to be open year-round operating at a temperature of 84-degrees and an outdoor portion of the attraction is expected to be completed this summer, which will include a 315,000-gallon wave pool. 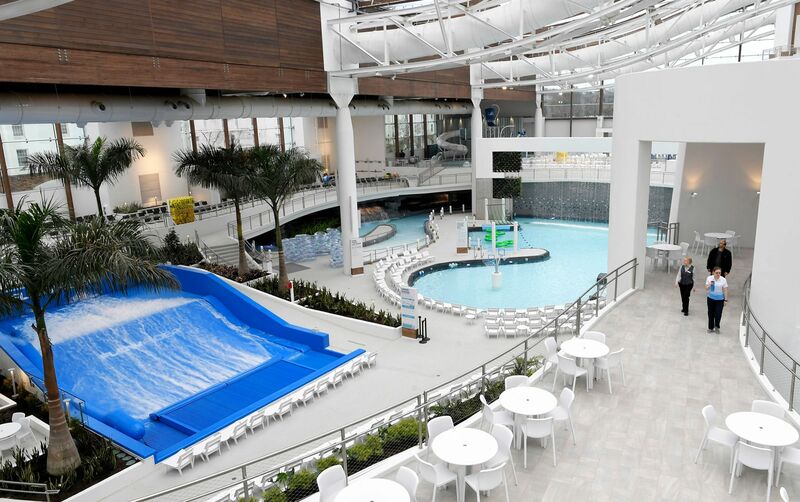 SoundWaves has a total of five waterslides across the 111,000 square foot indoor facility located next to the hotel’s famous 9-acre Garden Conservatory. The facility will also include its own restaurant, Decibels, two outdoors food trucks, multiple bars, private party rooms and Status Cymbal, an adults-only bar complete with an infinity pool at the top indoor level. ◆ Stage Dive Body Slides — A sliding adventure features two slides. Choose a translucent tube with LED lights, or try the opaque tube with no lights for even more suspense. ◆ Record Launch — Choose your adventure at the top. Pick the tubing bowl path for an intense centrifugal experience with 16 LED lights and four music speakers, or push the limits of gravity with our two-person serpentine water ride. ◆ Rapid Remix — Climb aboard a mega raft for four to five people and get ready for a breathtaking series of vortex loops, complete with 21 LED lights and 12 music speakers. ◆ Up Tempo Rapids River — Zip along our rapid river, complete with waterfalls and spray features. ◆ Down Tempo Lazy River — Grab a tube and float down this relaxing lazy river through cavernous rock features with LED lighting. ◆ Crowd Surfer — Nashville now has the only double FlowRider that lets two people surf at once. ◆ Groovin’ Lagoon Activity Pool — Fun for all ages, explore this pool area’s rock wall, lily pad walk, basketball hoop and 30-foot water curtain. ◆ Quarter Note Cove — Explore this splash pad and pool designed for young children. ◆ Half Note Cove — This multi-level play structure is great for kids of all ages with its multiple small and medium slides, shallow water and spray features. ◆ Beat Drop — The floor drops and riders plunge down a near-vertical tunnel to enter a looping waterslide. ◆ Bass Drop — This extreme high-speed, open-flume body ride is a six-story free-fall into 6 feet of water. ◆ Rock’N Racer — With four lanes, riders race each other through tight 360º loops to see who finishes first. A leader board at the bottom shows who won. ◆ Rising Stars Stage —This multi-level play structure is great for kids of all ages with its multiple small and medium slides, shallow water and spray features. ◆ Tidal Track Wave Pool — Waves come every 10 to 15 seconds on this beach that goes out to 6 feet deep, complete with a giant LED screen that can be viewed from the water or the hundreds of feet of shoreline.